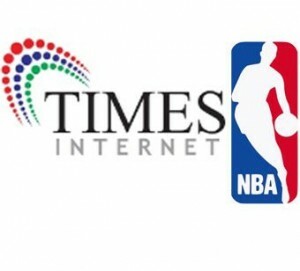 Times Internet Limited (Indiatimes), a subsidiary of BCCL has entered into a digital partnership with the National Basketball Association (NBA) of the USA to launch a section exclusively for NBA on the Times of India website. Earlier, the Times group in India had partnered with the Indian Premier League (IPL) for its mobile and internet rights and also launched a YouTube channel for the IPL in partnership with Google. The NBA section will have daily news and score updates, photo galleries, video highlights and articles from experts. Times group journalists will report on on-site, behind the scenes news of the 2011 NBA finals. Rishi Khiani, CEO, Times Internet Limited said, "With the growing popularity of basketball globally and more recently in India we plan to leverage our audience to help popularize the sport further and drive newer audiences to the game." Currently the NBA is in the second season of the Mahindra NBA Challenge (a multi-city, community-based basketball league) in India and recently launched a wide range of jerseys and merchandise in 200 Adidas stores in India. Heidi Ueberroth, president, NBA International, said, "We are in the midst of one of our most exciting playoffs in recent memory and the innovative, in-depth sports coverage provided by the Times group allows us to bring fans in India closer to the game." Earlier this year, Times Internet (Indiatimes) had launched TimesDeal.com in 6 cities in India and had extended its mobile deals and discounts service Active Deals to 25 Indian cities. The company also partnered with California-based Shorthand Mobile Inc. to launch an app called SMS Browser.